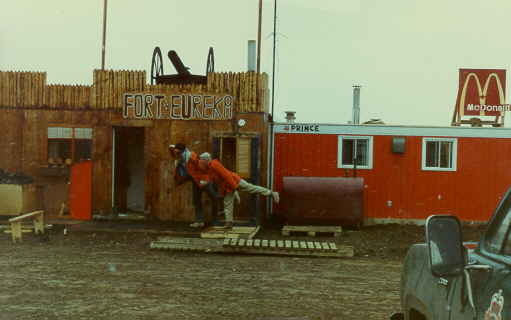 The Eureka weather station on Ellesmere Island, July 1988: Back to comfort. Table of Contents: On the road to Kabul and other short stories of treks. Eureka Weather Station, Early July 1988. Sea ice melting. 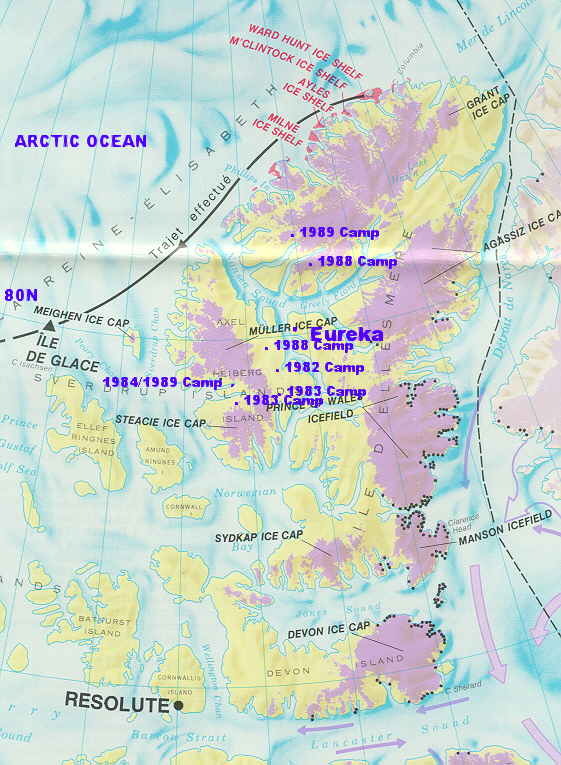 Eureka, 80o latitude, population 10 during the winter, more in the summer. A very comfortable place compared to our tents in the field. For us, a 5 star resort hotel. For others, total isolation, a desolate wilderness prison, with only one five-minute phone call per week to the outside world on a poor satellite phone. 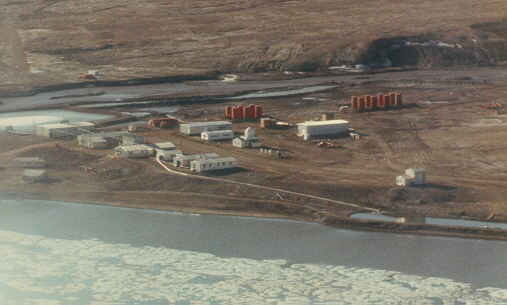 The Eureka weather station is located on Central-Western Ellesmere Island at 80o latitude, East of Northern Greenland . It is 2.5 hours flying by Twin Otter from Resolute Bay , the central hub in this area with bi-weekly airline connections South to Montreal and Edmonton, a 6-9 hour flight by Boeing 737, depending on the stopovers. Winters are cold, around -45o to -55o Celsius, with 2 month of total darkness. Summers are reasonable, 4-6 Celsius  (Eurkea in late summer) during the 24 hours of sunlight, the sun at an angle of 30 o (noon) to 20o (midnight) above the horizon, a mild West Europe winter sun. 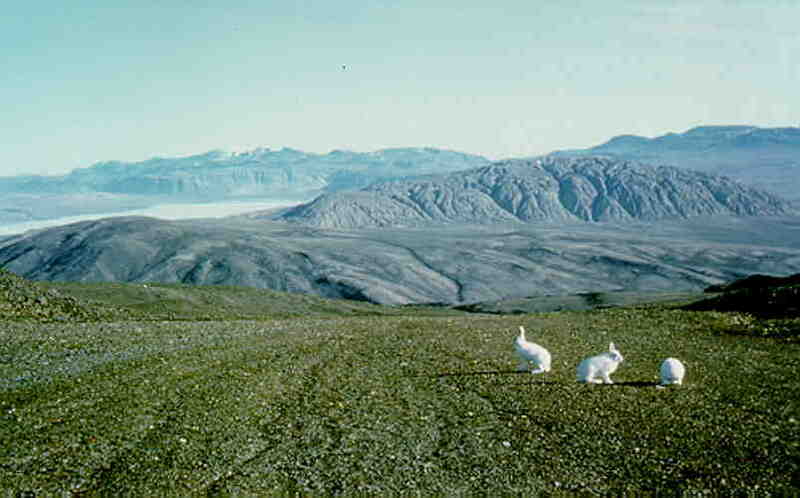 The mountain ranges  protect this area from the constant -1o to -5o Celsius Northern winds of the Arctic Ocean. Still, the constantly strong Arctic wind gives a chilly feeling when outside. Eureka has a wide gravel air strip allowing large military 4 propeller Hercules transport planes to land for supplies. The army has a small camp at the air strip . Most visitors travel by a 15 seat Twin Otter plane. Bulk supplies like fuel and building material arrive by supply boat in late August when the sea channels are mostly free of sea ice. The weather station is spacious and well-equipped, with some 30 or 40 simple rooms, a large kitchen, a TV room and a sports room. Here I learned to play snooker. Our ex-Vietnamese army helicopter pilot was beating us at least 21-1 in table tennis without moving his feet. After spending 4 weeks in the field on Northern Ellesmere Island in June and July 1988, our helicopter took us back to the Eureka weather station for a rest. This was badly needed to recover from the past 4 weeks. 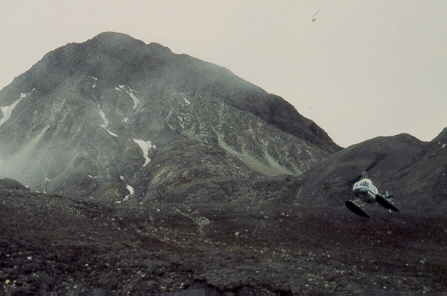 Especially the last camp high up in the mountains between the glaciers was cold. 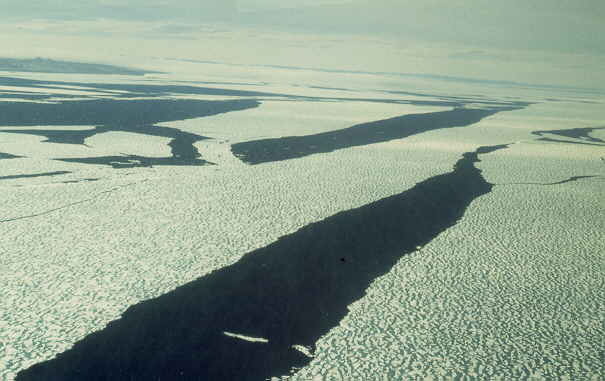 Now mid July, on flying to Eureka the sea ice in the large sea straits like Greely Fiord was breaking up . In Eureka we stayed at the Geological Survey of Canada site, two containers refitted with windows, bunk beds and a kitchen sink. Simple lodging but free of charge. The weather station would cost a staggering $150 per night per person, but all meals were included. The containers were very simple accommodation but functional. Most important, flat, level ground. Sitting on a chair that would not slowly destabilize by sinking in the soft tundra, felt like extreme comfort. A level and stable bed with a real 80 cm wide mattress was even better but the very best was a warm shower in the weather station. The barracks also had a book collection left by scientists. The only book that looked interesting was Malcolm Lowry’s "Under The Volcano". I read the thick book within the next two weeks, highly concentrated by lack of distractions. This is an impressive masterpiece about Mexico in the late thirties and the inability to enjoy life ('lebenskunst') of an older British consul and his young American wife. The book was said to be impossible to turn into a movie. Indeed, the only movie ever made covers only 30% of the book. The violent Mexican culture and empty lives of the main characters is lacking in the movie. Still, I did enjoy watching it, memories of the story line in the book guiding while watching the movie. As semi-government personnel from the university, we were invited to have free dinners at the weather station by the French-Canadian cook from Montreal, a real character. These were the leftovers and we always had to wait a 30 minutes for our turn but cookie never disappointed us. A year later, in 1999, I saw again in Eureka. Now I had to listen to his sad story. While drinking whisky heavily, he told us that he could not understand why his wife of 18 years suddenly divorced him. He worked year round at the station for the past 10 or 15 years, had a good salary, would spend the yearly 4 weeks of holidays with his wife from Montreal and would call her once a week. Some sort of boat captain's marriage. Très bien, n'est pas? He was in a sorry state, missing the exuberance and sharp remarks with his heavy French Canadian accent as I knew him from previous years. He also put on some extra weight and now had an even bigger belly. Now around 50 years old, his home was Eureka. The weather station had a log book for all visitors. Some of very few tourists visiting Ellesmere Island would stay here, perhaps on average 5 per week, en route to the recently opened Lake Hazen National Park, 250 km North, halfway between Eureka and the army base Alert on the North tip of Ellesmere Island..
Lake Hazen and Eureka are the warmest places in the region and have abundant wild-life like musk ox, caribou, wolves, foxes and hares. Lake Hazen is the only place accessible for tourists. Costs were $ 10000 (in 1988) for two weeks, lodging and air transport included. Recently, Russian ice breakers started to offer two-week cruises for € 12000 through the sea channels, e.g. from Resolute to Tanquary Fiord (close to Lake Hazen), passing by Eureka halfway. The tourists we met were generally retired, very rich people from the US, like Mr. and Mrs. John Smith from Palm Springs, the only tourists prepared to pay the $ 10000 for just two weeks of curiosity, not including the $ 1500 flight from Montreal or Edmonton to Resolute Bay. At the weather station, in 1988, they were charged double rates compared to government personel, US$ 70 per meal and the simple accommodation in bunk beds was over US$ 100 per person. Hilton Hotel prices at less than YMCA comfort. 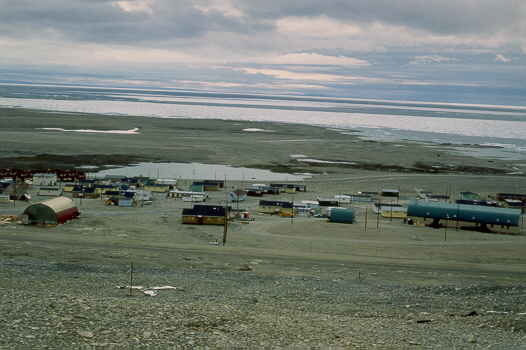 Normal tourists would get stuck in Resolute Bay, the last real airport for jet planes. They would wander around a bit, unable to get very far as the threat of polar bears would prevent this, visit the Inuit village composed of small wooden cottages and stay in the only hotel. Still interesting. The only dirt road runs from the airport, to the station and a further West to a cape with satellite dishes for communications. These were built at this location as the high latitude required an open space for receiving signals as they were aimed to the South to a satellite at only 1 or 2 degrees above the open sea. The dishes allowed us to make satellite phone calls South with its annoying half second delay and one way traffic. On a trip to the satellite dishes, not paying attention, I nearly drove of the trail driving the old PCSP government truck. This would have been an embarrassment as it was the only truck for our group of scientists. Renting a truck from the weather station was very costly. Our truck was flown in a few years ago as a favor of the Canadian Air Force getting a free ride on a Hercules transport plane. My student took the truck once for a night ride, and he got stuck in the mud by driving off the road. Great student joke and very typical so I let him dig it out first and gave him a hand finally using wooden planks to get it out. I hope this was a good learning experience. On a trip East along the coast we borrowed the stations mountain bikes that were meant to encourage the stations personnel to do some physical exercise but nobody used them. After a few kilometers along the beach having a fierce head wind we got stuck in beach gravel and sand and walked along with the bikes. The beach had a lot of plastic, rope, plywood, glass bottles, etc., more than you would see on a beach in Europe on a winter day as they are cleaned up regularly. This must have drifted in along the sea straits from Baffin Bay or even the Arctic Ocean, and kept on accumulating, enhanced by the strong wind in the fiord. Another example how every corner of the world is already polluted, a new world-wide geological marker horizon. I was told that the visibility was 100 km in this area in the fifties but now it reduced to only 0 km, air pollution. One night as I was walking from the station to our camp a wolf was crossing our camp site probably looking for scraps. It looked at me for only a few seconds and steadily wandered off. It is very typical for wolves to always keep a fair distance so you can never take a close-up picture. Also see . National Geographic TV has shown documentaries of the white Arctic wolves of Eureka that have a den nearby. The cook often feeds them left over food. The personnel consisted mostly of young or middle aged men except one, a girl recently graduated in Atmospheric Studies. She was from Montreal and in our imagination she could only be good looking after spending 4 weeks in the field, perhaps she was. She explained that it was hard to find a job down South in a weather office and the first few years you would have to take isolated postings. This implied you would spent the next 4 to 5 years in the highest Arctic with only 4 weeks holidays. She thought this was great showing no signs of being home sick. She loved being in such isolated places. As males, we had second thoughts, running away from something? Eureka is the official and only border post to leave and enter Canada in the North. North Pole expeditions start from the North tip of Ellesmere Island (Ward Hunts Island) to cover the 800 km to reach the North Pole. Others start in Russia and do a cross Arctic Ocean trip but this is rare. There are several stations like Eureka in Northern Canada, all spaced at a distance of 300 to 500 km: Resolute Bay in the center, Tuktoyaktuk in the West, Alert at the North end and the well-known Thule which is also an American air force base on NE Greenland. Isachsen on Elef Ringness Island and Mould Bay on Banks Island have been abandoned. They were already built after the Second World War, also to avoid Norwegian claims to the lands as they were the first to explore and map the region in the late nineteenth century. 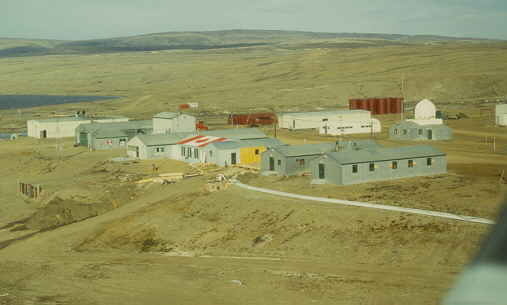 The stations were expanded during the cold war for NORAD, the Northern defense system against nuclear rockets from the Soviet Union. The last time I visited Eureka was in July 1989. After waiting 3 days for a helicopter at Expedition Fiord, on the West Coast of Axel Heiberg Island we were evacuated, see , but we could only take one helicopter load due to the poor weather  and left half the equipment at a glaciologists shed at Expedition Fiord, the only building of Axel Heiberg Island. As we landed, a Twin Otter was fueling up carrying three female biology students. We recognized the siren voices we had on the unrestricted chatting channel of our radio for the past two weeks. Their voices still sounded wonderful. The girls were well equipped to handle the cold, big!